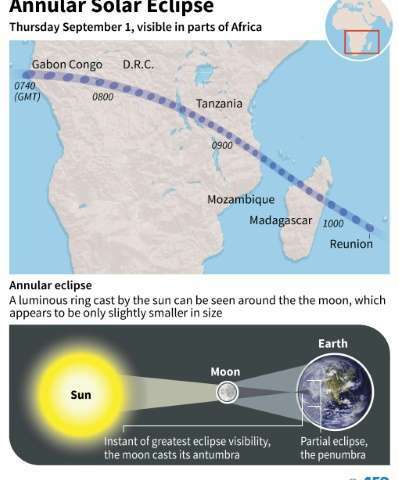 At the eclipse's peak, all that was visible was a ring of light encircling the black Moon—but the phenomenon was only fully visible to people in a narrow, 100-kilometre (62-mile) band stretching across central Africa, Madagascar and Reunion. Anyone north, south, east or west of the band experienced only a partial eclipse, or none at all. 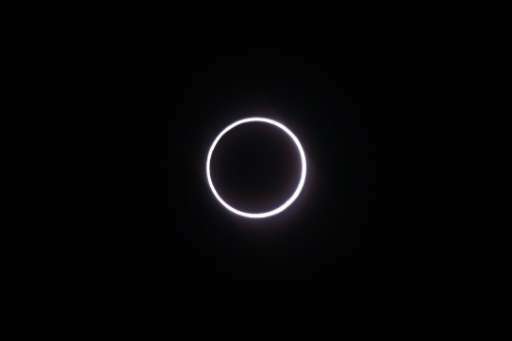 The phenomenon, known as an annular solar eclipse, happens when there is a near-perfect alignment of the Earth, Moon and Sun. But unlike a total eclipse, when the Sun is blacked out, sometimes the Moon is too far from Earth, and its apparent diameter too small, for complete coverage. "I wanted to see it because even my daughters will be too old to watch the next one in 200 years," joked Jeremy Grondin, who watched the event with his two young daughters in the south west of France's Indian Ocean Reunion Islands. It was there that stargazers had the best view of the solar eclipse, described by Pascal Descamps of the Paris astronomical observatory as a "magical moment". On the island, the moment lasted just 2 minutes 33 seconds and took place shortly after 1000 GMT. Spectators had to don special protective glasses to filter out the Sun's harmful ultraviolet and infra-red rays. Viewers could also use a pinhole camera, a box with a hole on one side for light to pass through, projecting an inverted image of the eclipse on the opposite side. On the French Indian Ocean territory of Mayotte off the east coast of Africa, prayers were said in mosques calling for residents to be spared from harm.